Clarification: For the back, front, and sleeves, the written instructions tell you to keep a single stitch in stockinette at each edge in addition to the stitches to be worked in the Dogwood Lace pattern (2 for the sleeve in largest size). Written stitch instructions for the 16 rows of Dogwood Lace are correct and do not include these edge stitches. If working directly from the chart, the chart in the book is correct, but omits the edge stitches. 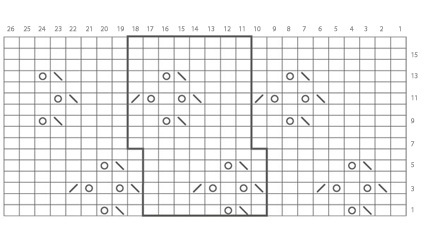 The following chart includes the edge stitches if this helps you follow the pattern more easily.